fficers try to uncoil a reptile-smuggling racket, it was reported on Friday. 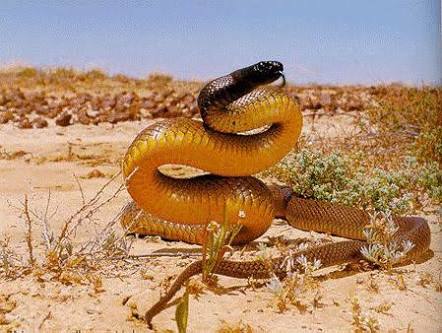 A death adder and king brown snake among the deadliest snakes in the world were part of a haul of 93 reptiles hidden in six packages posted from the remote mining town of Kalgoorlie in Western Australia, wildlife officers told broadcaster ABC. Other reptiles shipped included geckos, skinks and lizards. The reptiles could have fetched 119,000 U.S. dollars on the black market. Wildlife officer Matt Swann, said the animals had been caught across West Australia, and that this was one of the largest intercepts of illegally marketed animals in Australia. They were inside plastic containers which could have broken open, letting the deadly snakes escape in the postal system. Five reptiles died before they were discovered. “They pose a real threat and risk to the people involved in the transport and handling of these packages, and that can have fatal consequences,’’ Swann said.